Alex Trevino, Founder of Alex Trevino Law PLLC, opened his own practice to reconnect with his extensive professional and personal network, including the local Spanish-speaking community. His goal is to offer affordable legal services within the local community in the practice areas of workers’ compensation, small business, contracts, negotiations, estate planning, and general unbundled services. Learn more below! I have wanted to be an attorney since I was in 7th grade. My plan was to obtain my bachelors and go to law school in one straight shot. Life had a different timeline for me. I started raising a family in my early 20s, and put education on hold. After a 20+ year career in auto sales and finance, I became a lawyer. I practiced at a medium-sized insurance defense law firm for 2 ½ years as I planned and prepared to go off on my own. 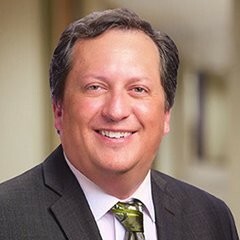 My practice consists of workers’ compensation (representing injured workers and occasionally an employer), business law (including acting as Outside General Counsel, contract negotiations and drafting, buy/sell transactions, and more), small estate planning, and unbundled services (limited-scope and/or random legal representation). I have a vast network of attorneys and professionals to whom I can refer someone if I am not the right person. I have a client, who is a one-person operation, for whom I negotiated and drafted a contract between my client and a multi-million-dollar corporation. We negotiated some clauses to protect my client in case the big company “pulled the plug” on the project, which of course, it eventually did. My client, with some advocacy from my office, received the full value of the agreement, which included pay for the work already performed, and the remaining value of the contract, which was in the hundreds of thousands of dollars. This is a good and a bad thing. I have been lucky to have received many referrals from friends, colleagues, and organizations. As a result, I have been extremely busy and have not had (or made) the time to write content for my website or social media pages. I learned early in my law career that my biggest weakness, or room for improvement, was organization and time management. As a result, I have attended a few seminars on time management, efficiency, and organization. While I am a work in progress, I have found my productivity has increased, the quality of my work has improved, and my overall stress level has gone down. My words of wisdom are: identify what part of your job causes you the most discomfort and address it head on. Oh boy. I am not sure that I can narrow this one down to any one individual as I have had multiple individuals and resources who have taught me “things.” I guess that the biggest game-changer for me has been learning and applying the principles from Rhonda Byrne’s “The Secret.” I did not read the book, rather I listened to the audio version. It took listening to it multiple times, and I still will listen to it every few months. In short, The Secret has allowed me to change my thinking so that I have been able to achieve many of my dreams – including some that I had written off as unachievable. I am able to speak Spanish and English equally fluently, and without an accent in either language. I would want the ability to grant people’s wishes – like a genie. I was looking for an office space that is welcoming to me, to my clients, and to opposing counsel. I wanted a space in which I can work all day comfortably. It had to be suburban, yet near mass transit, as I have some clients who do not drive. I also was looking for affordability. I did my due diligence in comparing, and visiting, many options. I found OffiCenters and International Plaza to be my best fit. I am very happy with my decision. My website is under construction (alextrevinolaw.com), and I have Facebook and LinkedIn pages. Twitter and Instagram will follow soon. You can always email me at alex@alextrevinolaw.com or call/text my cell phone at 651-442-8727.